In the assessment year 2004-2005, the assessesâ€™ total income was Rs.20, 92,400/-. A return of income was filed which included long term capitall gains which inturn arose from the sale of a flat bearing No.1202-A at Chaitanya Towers, Prabhadevi, Mumbai. The flat in question was initially purchased by the daughter of the assesse on 29/1/1993 at a cost of Rs.50, 48,350/-. The assesse dated 1/2/2003 then acquired ownership of the flat by way of gift deed and thus paid no amount towards the transfer of the flat to the daughter. On 30/6/2003, the assesse sold the said capital asset for a total consideration of Rs.1,10,00,000/- and offered the long term capital gains to tax. The assesse argued that the asset which was acquired by her, and subsequently sold by her in the same year, the gains arising from it should be taken as long term instead of short term gain, as argued by the Revenue. The gain should be adjudged on the basis of indexed cost of acquisition minus the consideration received by her. The A.O. argued under Explanation (iii) to Section 48 of the Act, the indexed cost of acquisition has to be determined with reference to the cost inflation index for the first year in which the asset was first held by the assesse. The A.O. stated that the asset was first held by the assesse for the first time in 2003 and not in 1993. The decision was appealed by the assesse, CIT(A) allowed the claim of the appellant, that decision was further appealed by Revenue, but the ITAT agreed with the decision of the CIT(A). Revenue has challenged the decision of the ITAT. Revenue argued that under explanation (iii) to Section 48 the indexed cost of acquisition has to be determined with reference to the first year in which the capital asset was held by the assesse. In the instant case, the capital asset was first held by the assesse on 1/2/2003. Therefore, the ICoA (Indexed Cost of Acquisition) must be calculated on the basis of 2002-03. It was argued by the Revenue there is deeming fiction contained in Explanation 1(i)(b) to Section 2(42A) of the Act and therefore we cannot apply that language in contrast to the specific language of clause (iii) of the Explanation to Section 48 of the Act. The object of the provision, i.e. Explanation 1(i) (b) to Section 2(42A) is for determine whether a particular asset is long-term or short-term, it is not there to be applied in determine the ICoA. Revenue argued that the provision to determine ICoA is explanation (iii) to Section 48. In the case of DCIT V/s. Kishore Kanungo, decided at Mumbai Bench of the ITAT wherein it has been held that under Explanation (iii) to Section 48, the ICoA has to be calculated with reference to the CII (cost inflation index) for the first year in which the asset was held by the assesse and not with reference to the CII (cost inflation index) for the first year in which the asset was held by the previous owner. In an SC Case of CIT V/s. Anjum M.H. Ghaswala & Ors, the court held where the language of a statute is clear and unambiguous, one has to apply the literal interpretation and not the purposive interpretation. The Assesse argued that for the calculation of ICoA, the date of first holding of asset be taken as 29/1/1993 and not 1/2/2003, as she has received the property through gift and a bare reading of section 49 makes clear that for the purpose of calculating ICoA, the time period of holding will include the time period for which the previous owner of the property held the assets in question. The only question before the court was that when one computes capital gains that arise on the transfer of capital assets acquired under a gift, whether the assesse will be evaluated on the indexed cost for acquisition which was for the previous owner when he first held the assets or when the assesse became the owner of the assets, in the case the assets is acquired by the assesse as a gift from the previous owner. Under Section 45 of the Act, the gain that arise from any transaction of transfer of capital asset can be classified into either long-term or short term capital gain. Short term capital asset is defined under Section 2(42A) and long term capital asset, as defined under Section 2(29A) of the Act. Under Section 47(iii) of the Act states that when a capital assets is given by gift or will, it will not be regarded as transfer and therefore no short-term or long-term gain would have said to be arisen form the said transaction. In the present case, the flat was first acquired by the daughter of the assesse on 29/1/1993, the same flat was given by the daughter to the mother by gift on 2/1/2003 without consideration. The assesse sold the flat within 36 months, and under normal course she would have been liable to pay short term capital gain, but explanation 1(i)(b) to Section 2(42A) of the Act saves her, and classifies her asset as long term capital asset. Revenueâ€™s main contention was that when the ICoA is calculated as per explanation (iii) to Section 48 of the Act, the first year of holding should be FY 2002-03 and in view of the first year of holding the CII should be taken of the year FY 2002-03. The court found no merit in the above argument and stated that it is undisputed that the ICoA has to be determined on the basis of first year in which the asset was â€œheld by the assesseâ€. The term â€˜held by the assesseâ€™ has not been defined under Section 48. So we refer to the definition clause of the IT Act, i.e. 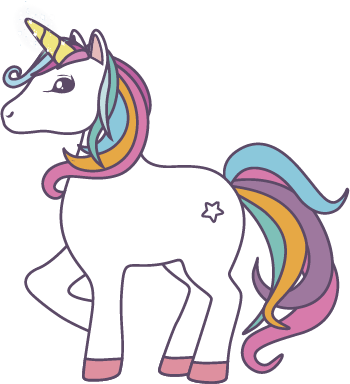 under explanation 1(i) (b) to Section 2(42A) states that the period for which an asset is held by an assesse under a gift, the term of the previous owner holding shall also be included. So, by applying the provision of under explanation 1(i) (b) to Section 2(42A), the asset is deemed to be held from 29/1/1993 Revue argued that the deeming provision must not be considered for calculating ICoA, as it is intended to differentia only between long-term and short-term capital gain. The court held that when the law-makers have made the deeming provision to tax the gains arising on transfer of a capital asset acquired under a gift or will and the capital gains under Section 48 of the Act has to be computed by applying the deemed fiction. 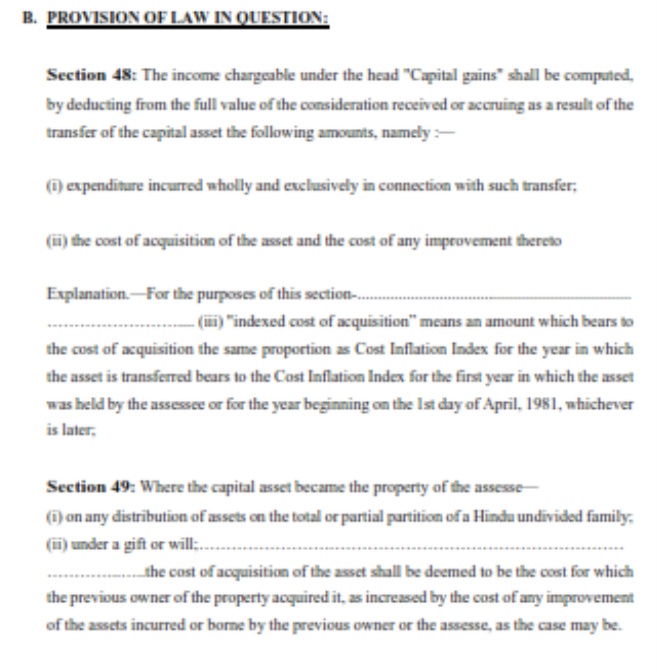 The Court held that when explanation 1(i)(b) to Section 2(42A) , Section 48 and Section 49 of the Act, are read together and not in isolation with each other, it becomes clear that the object of the statue is not only to tax capital gain from transfer of capital assets but also to tax the transfer of capital assets acquired under gift or will. The court held that it cannot ignore the provisions of Section 2 and apply the provisos of Section 48, doing that would defeat the entire purpose of the act. Section 2 of the act states that unless the context otherwise requires, the provisions of the Act have to be construed as provided under Section 2 of the Act. If the court ignores the meaning under section 2 and doesnâ€™t take its support in constructing the meaning of Section 48 then gains that arise from gift or will cannot be taxed as capital gain in any case, and that will be contrary to what the legislature has intended. So the court was of the view that the arguments by the revenue are in contravention to the legislative intent and this cannot be accepted under any circumstances. The said circular states that if indexation is linked to the holding of the asset and if Section 49(1) applied then, period of holding has to take into account the period of holding of the previous owner, and then only the object of indexation will be achieved. The court held that ITAT was correct in holding the period of holding to include the period in which previous owner first held the asset and not the year in which the assesse became the owner of the asset.